This post sets out the results of the poll. 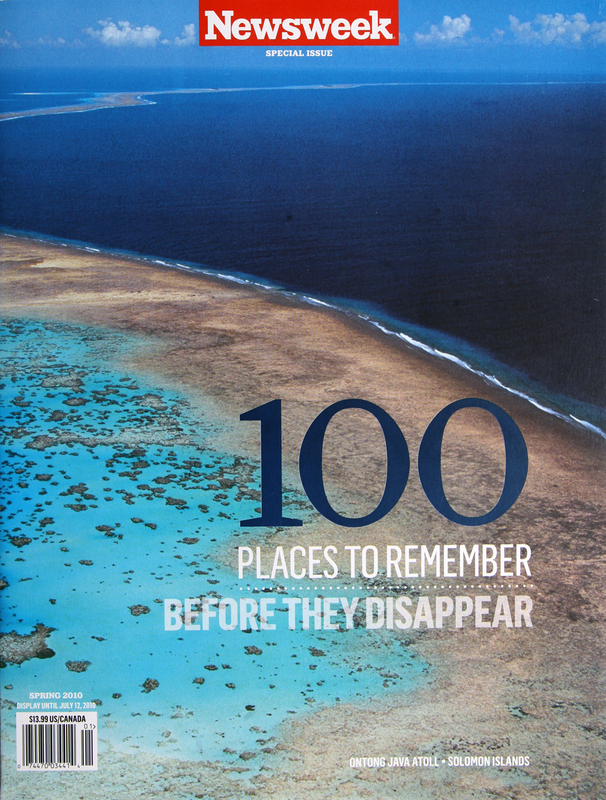 I also have a comment piece today in Climate Home, which discusses its findings. We conducted two separate polls, in the UK and the US. The questions were essentially the same, except for small differences in language. 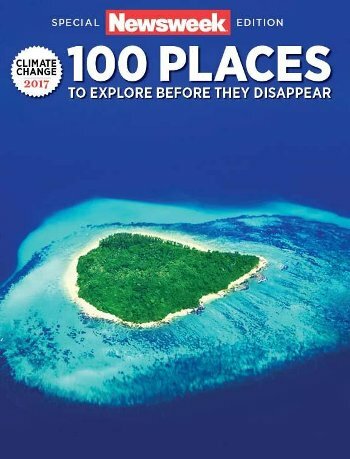 Full data is available here. Regardless of your own political views, what kind of person do you think is generally most worried about the following issues? How worried are you personally about each of the following issues? 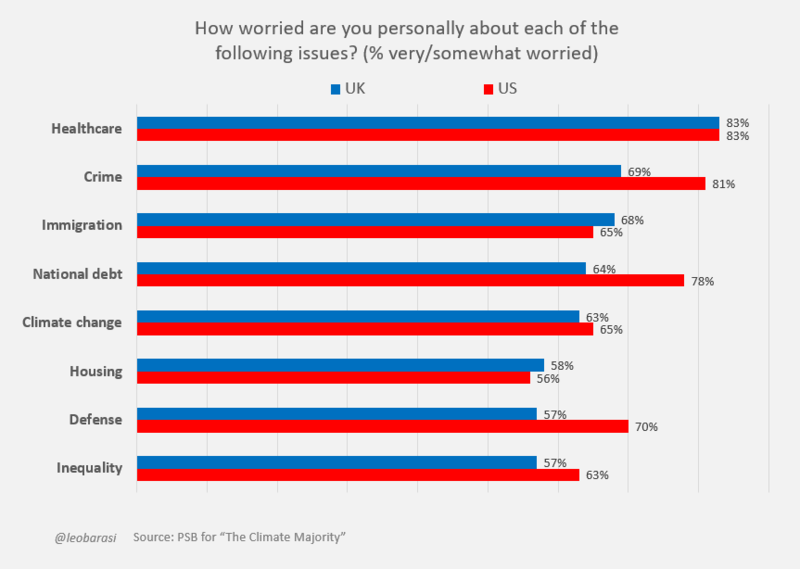 In both countries, climate change is one of the issues that worries the most people. Healthcare is comfortably top (the polls were conducted in November-December 2016, so before the latest US healthcare debates but also before Trump increased attention to climate change) but climate is in the next group, along with immigration and crime. It’s a bit higher in the list if we look only at how many people are very worried, but not much lower if we also look at those who are somewhat worried. Either way it sits along issues that are usually considered of national importance. 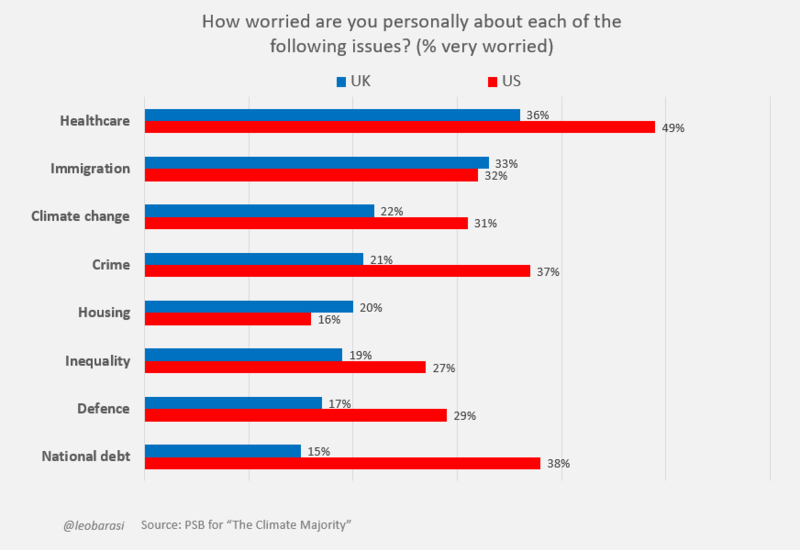 Climate change is widely seen as an interest of liberals in the US. Along with inequality, it stands out as being perceived as the issue about which concern is most restricted to liberals. It is also seen as the one with the greatest partisan skew: 46% think liberals are the people most worried about climate change, compared with 41% thinking conservatives are the people most worried about immigration. Now onto the reality of who actually is worried about each of these issues. 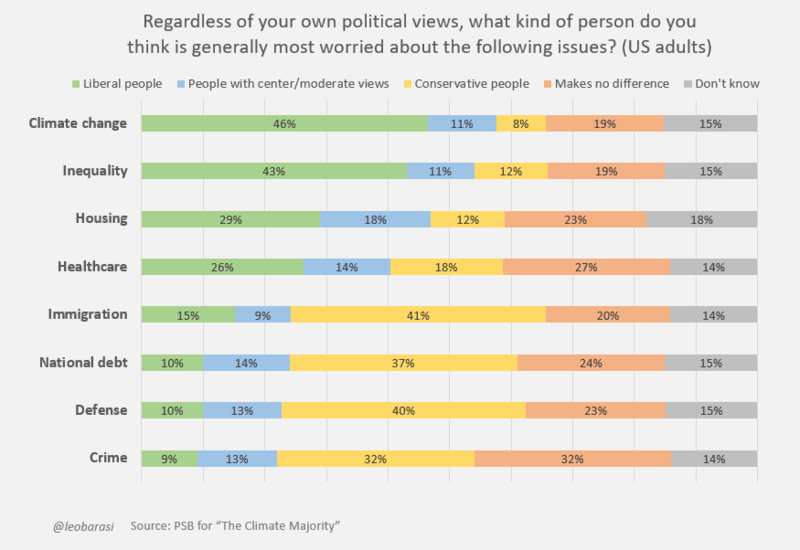 Despite the skew, more moderates are very worried about climate change than are very worried about most other issues. Even if we also look at somewhat worried, it’s still a top concern of moderates – not just of liberals. So, a reason the skew looks so big is because conservatives are mostly unworried about it. 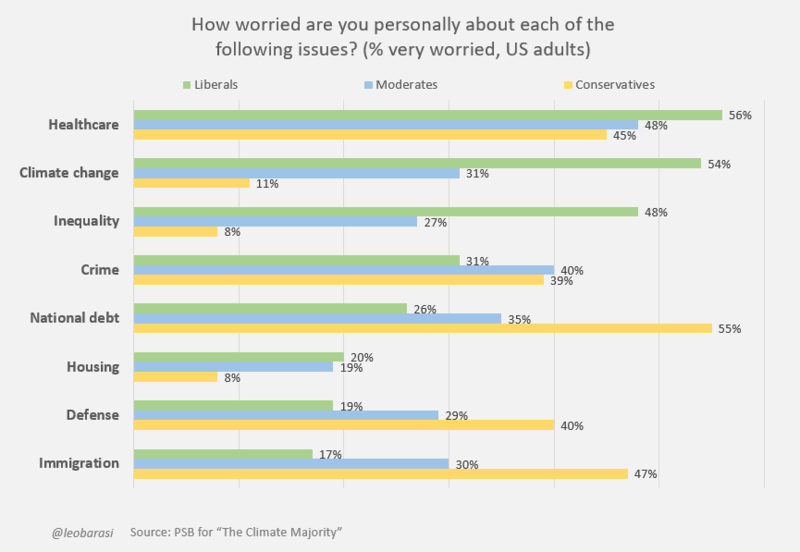 Liberals are more worried about the issues that are heavily associated with conservatives (defense, immigration and national debt) than conservatives are about supposedly liberal issues like climate change. This is arguably more a story about conservatives being notably uninterested in climate change than liberals being unusually interested. 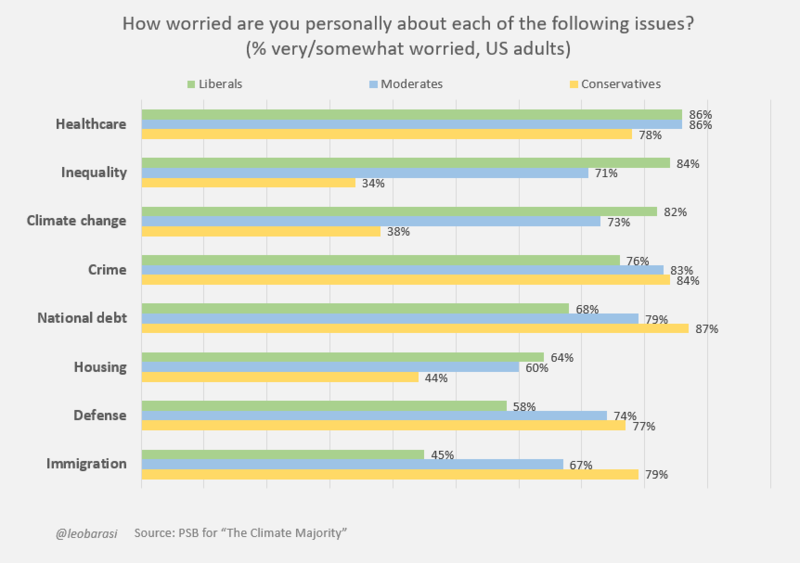 So in the US, climate change is seen as a liberal issue but it’s actually one that liberals and moderates are widely worried about. It’s only conservatives who are generally not worried. The most striking result is that polarisation in the UK is much less than in the US. 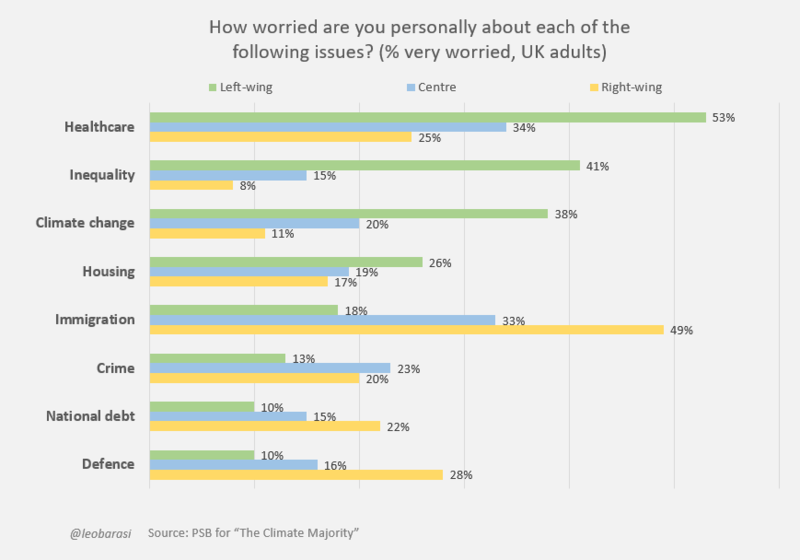 While climate change is often seen as a left-wing issue and immigration as a right-wing issue (and so on) most issues are mostly seen as having no political skew. That is, in most cases a plurality think that people’s political views make no difference to whether they are worried about the issue. 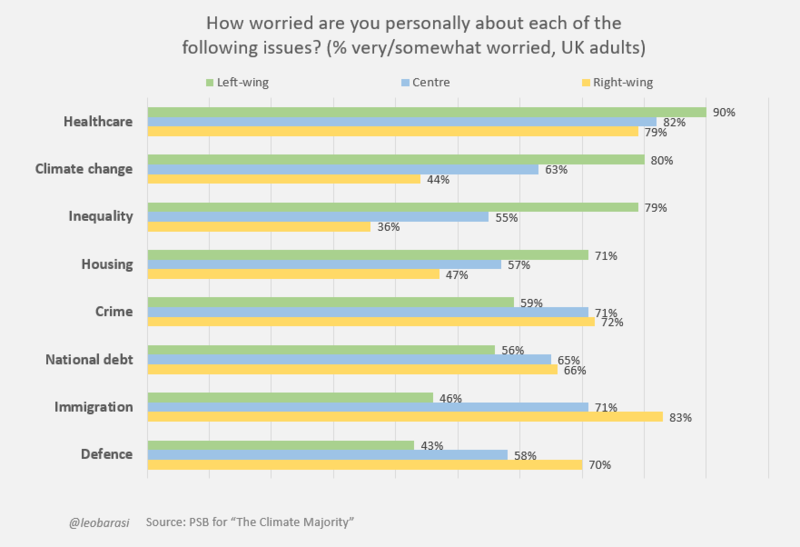 … but one reason it’s less polarised in the UK is that left-wing British people are less worried about climate change than US liberals (this isn’t because the poll defined US liberals more narrowly than the UK left – in fact it took 28% in the US as liberals and 18% in the UK as left-wing). Conservatives / right-wing people are similarly relaxed about climate change in both countries. 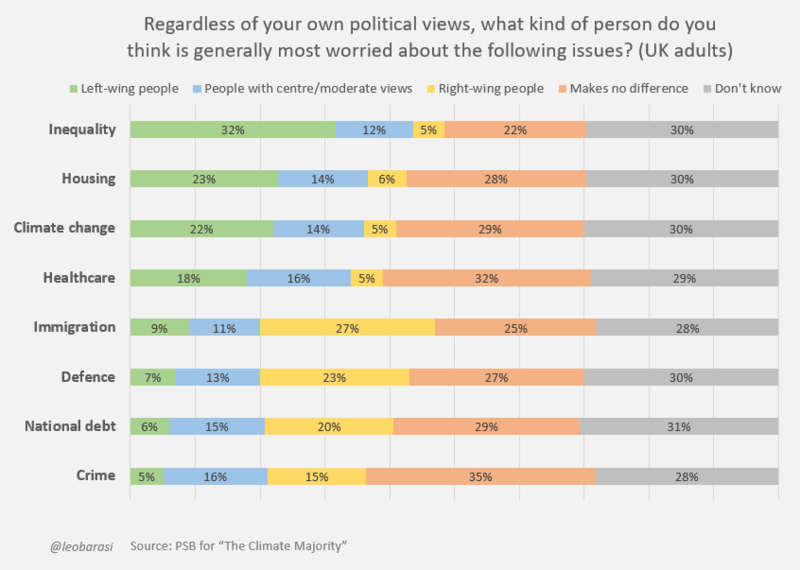 The polarisation seems to be less in the UK because the British left are, generally, somewhat less worried rather than because the US right are so opposed to dealing with it (although that ignores a separate point that the US right includes people who are much more vituperative in their opposition to dealing with climate change than most of the UK right are). 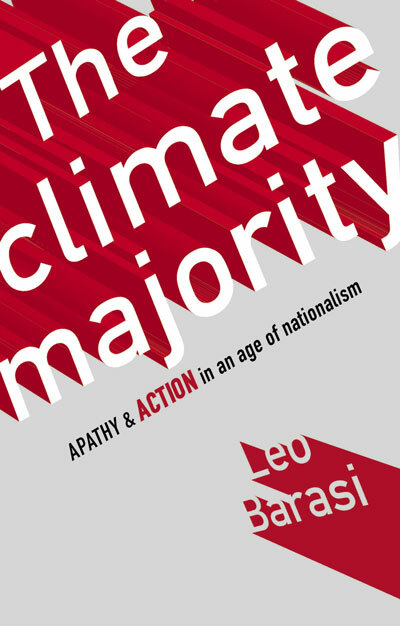 My book, The Climate Majority, looks at the consequences of climate change being seen as a left-wing concern – how that limits action to cut emissions, and how those of us worried about the problem can overcome the polarisation.